The new High-performance panel sizing saw blade with Cutting 2.0 Technology provides the best possible finish cut quality in universal material usage and with long service life. Customers' experiences with this new saw blade have been purely positive. In the field test performed in various industrial companies throughout Europe, tool life increases of up to 70% were achieved. The finished cutting quality was rated either "very good" or "good" by all testers. Noise emissions were reduced by 10 dB (A), which corresponds to a noise reduction of 50%. The same saw blade was able to cut through a mixture of materials, including chipboard, MDF, plywood and HPL, just as reliably and cleanly as it would cut any material in individual machining. At the end of the tool life, the panel sizing saw blade 2.0 has shown these results: Total costs 35% lower compared to circular saw blades of other manufacturers. Energy saving effects not included. Thin-kerf version: -25% power consumption and -25% material usage. 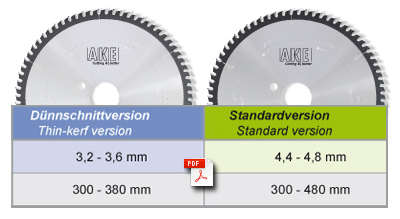 The innovative Panel sizing saw blade 2.0 is now available in all standard dimensions. A change to cutting 2.0 - without further adjustments of the machine - is possible at anytime. 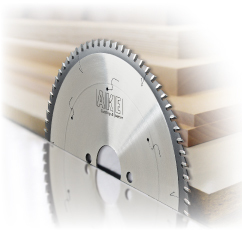 AKE has developed a completely new saw blade design for materials that tend to produce crumbling chips, with no (!) conventional chip gullet. In addition, a tooth has been developed that is specially designed for this different cutting process. It has an extremely minimal design, focussed entirely on the cutting task at hand – and therefore on producing chips and transporting them away. AKE calls this method of cutting edge design "MicroGeo". As soon as chips leave the cutting edge, they are immediately and precisely directed into flank faces positioned laterally in the basic body of the saw blade, where they can release their tension without rubbing excessively against the lateral flank faces. 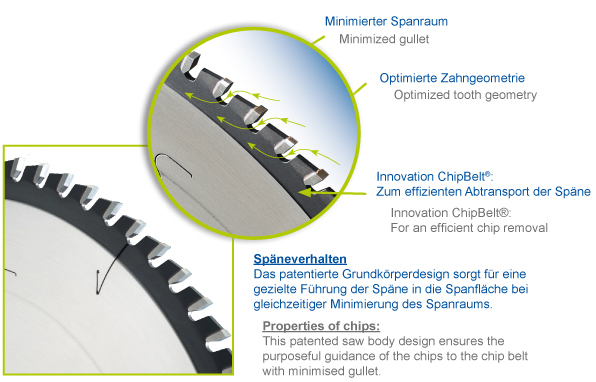 AKE has coined the term "ChipBelt®" for this alternative chip gullet, as it is positioned along the circumference of the basic body on both sides, like a belt.